As part of its current operating award, IRIS provides expanded support for special services related to permitting and access to active seismic sources (explosions and vibrators) that are used in reflection and refraction studies of the crust. A sub-award to University of Texas-El Paso allows IRIS community members to utilize their long-standing expertise in land-based controlled seismic sources for academic seismic projects and to receive training for permitting and deploying explosive shots. Galen Kaip is the main point of contact for the UTEP resources and training opportunities. Please see more at the UTEP Seismic Source Facility. 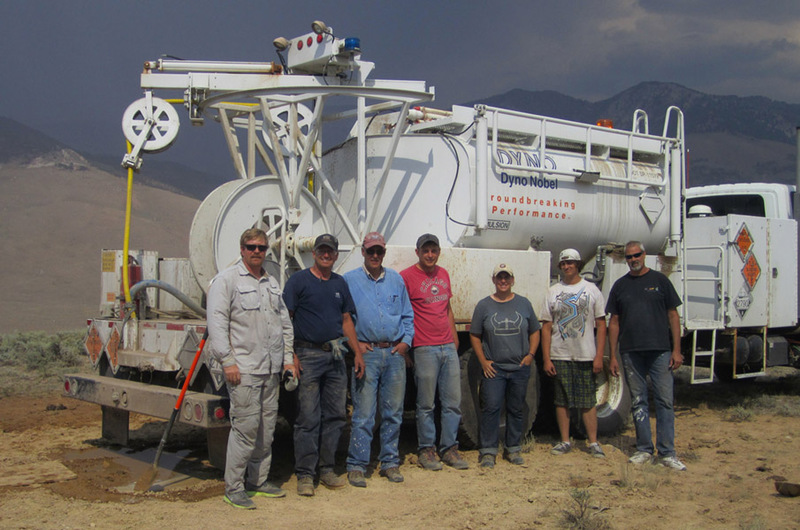 EarthScope IDaho-ORegon (IDOR) 2012 seismic refraction / wide-angle reflection survey shot loading and stemming crew, led by Steven Harder (third from left), in front of the explosives pump truck.